A fascinating and frightening facet of life is the realization that the more one “knows,” the more one doesn’t know. The more one digs, the more there is to be dug. Such is certainly the case when delving into the eccentricities of a particular state. Despite the stereotypes, Montana is an eternally-intriguing polity, offering fascinating experiences for the traveler, as long as they don’t mind getting a little dirty. Below are some of the more unusual Treasure State attractions. The Montana Vortex in Columbia Falls is one of the coolest natural anomalies in America, let alone Montana. It presents a gravitational anomaly in which individuals appear to shrink and grow as they walk mere feet on a level surface. Dangerously-slanted structures, abnormal tree growth, tangible magnetic fields and other peculiarities are plentiful here, all perplexing byproducts of a quantum fluctuation that’s yet to be explained. The on-site House of Mystery is similarly mind-shattering. Things don’t make sense in the vortex, and it couldn’t be cooler. Montana is home to a wealth of dinosaur fossils—The Montana Dinosaur Trail is a road-trip magnet that extends across the state, encompassing 17 museums. Bynum is a small roadside blip, but hosts the Two Dinosaur Center, easily discovered via its large T-Rex statue at the entrance. But this beast pales in comparison to the full Seismosaur—a 137-foot predator resembling a T-Rex/Allosaur hybrid—named Guinness’ largest complete skeleton in world. And while at the center, take a tour and learn about archaeology and Montana’s vibrant history of terrible lizards. Montana’s first state park, Teddy Roosevelt named this limestone labyrinth a national monument on the same day as Grand Canyon. Something out of the imagination of HR Giger, over 3,000 acres of stony catacombs surround tour-goers, an eerily-vibrant system of speleothems—stalactites, stalagmites and other cave deposits, simultaneously alien and terrain. The Wild Cave tours are the way go: for $30, a guide leads cave expeditions with only authentic headlamps for light. A fascinating museum in its own right, this Western prison complex housed a number of famous criminals. Its history attracts lovers of the Old West, of Montanan traditions, of prisoners and their stories. And, in the last decade or so, the complex has attracted those seeking-out the paranormal. And it’s easy to understand the allure. The ominous vibe has a palpable tenseness: The intimidating, brick-encased environs couldn't be any colder, any less alive. Sounds of all sorts echo the stone halls and ring into infinity the machinations of felons’ past. Yes, that’s right: The Testicle Festival. Thousands of Montanans and visitors from around the nation descend on Clinton during the first week of August. Battalions of RVs, motorcycles and SUVs carting hordes of famished party-goers. “Testy Fest” is a raucous week of live music, DJs, contests, rivers of beer and, yes, Rocky Mountain Oysters—fresh bull testicles breaded and fried to a delicious golden brown. And, for the uninitiated, don’t fear. These morsels are tasty—just picture something like a chicken nugget. And if that doesn’t work, there’re burgers, too. The abandoned mansions and vacant properties of Old West aristocracies have an eerie charm. The drying-up of mining left many of these venues, while maintained, empty and beckoning for visitation. This elegant and intimidatingly-detailed castle reverberates with occupants’ past. Believers assert seeing the apparition of the head maid, as well as TC Power himself, in the same room in which he died. Be one a skeptic or otherwise, the building’s immensity, the domineering aristocracy embodied in its orate fixtures, and the damp, ancient must only serve to embolden one’s (sub)conscious fears. A large, bearded man speeds by, careening down a snow-covered slope, fixing himself to his transport with clenched fingers. He’s on a barstool. Yep, the barstool races are somewhat of a famous oddity near the Gateway to Glacier. Approaching its 40-year anniversary, the ritual is part of the annual Cabin Fever Days, a weekend of winter activities for families and fun seekers alike. The weekend serves as a fundraiser for local nonprofits, packed with food, games, contests, and most interestingly, the barstool races. There are several age and skill-level groups, with the championship race taking place on Sunday. Some fads surge and die. Others fizzle-out, but don’t quite fade. The tiki bars of the mid-20th century are mostly gone, but the few that remain do so in style. The nostalgia of the post-war Pacific and the romantic aura that followed troops back to the states remain in full-swing at the O’Haire Motor Inn. There, the Sip ’n Dip bar in Great Falls happily holds-on to those cliché relics, in the best way possible: Hula girls and grass facades and a collection of umbrellas sprouting from island cocktails. And the view from the bar is unmatched: A full pool rests behind glass, it’s flickering light casting a blue hue on the space. Within swirls a beautiful mermaid—yes, a living one—a dervish suspended in blue light, a moving painting that dances happily as one sips a sweet mixed-drink. Most, if not all Montana ghost towns are centered around mining and resource extraction. But St. Marie is unique. First, its abandonment is recent, and second, a small population still exists on its privately-owned outskirts. The Glasgow Air Force Base was another Cold War operation that spawned its own town—St. Marie was built to house the airmen and base employees. But when the base folded in 1976, the local economy imploded and most people vacated. Given its recently becoming a ghost town, and the fact that a small population still lives in its environs, St. Marie’s emptiness seems more eerie in its recentness. It’s as though an apocalypse only just abated, like the populace picked up and left in a hurry. It’s the opening scene of The Walking Dead, sans zombie (hopefully). 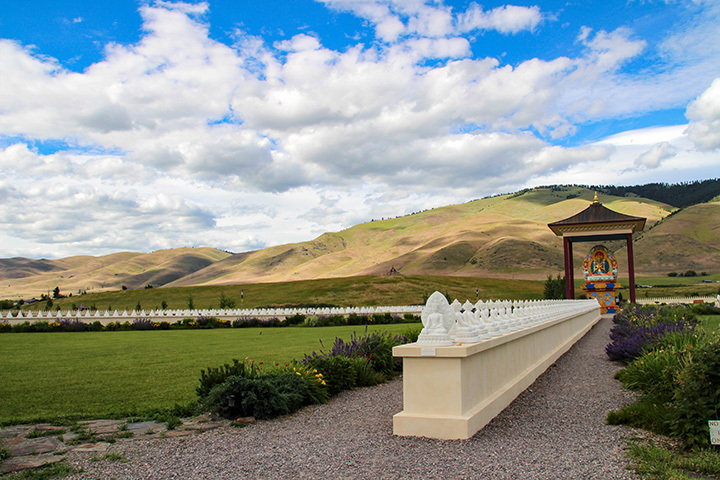 Montana and Buddhism—it’s like peanut butter and…ketchup? In the middle of the Flathead Indian Reservation stands a Buddhist shrine, a spiritual locus intended as an “International Peace Center.” Other than its obvious Eastern novelty, the complex is impressive in its succinct precision and organization: An aerial view reveals 1000 Montana-made Buddha statues sitting symmetrically on an 8-spoked dharma wheel, the center of which is a beautiful sculpture of the “Great Mother of Transcendent Wisdom.” The pristine scenery surrounding the garden only adds to this hub of peace. So, come for the landscape, the Spartan architecture, classes in mediation, or the 1,000 statues. Or, simply arrive, relax and let yourself be truly absorbed. 12. Enjoy the dam view! It’s very ironic: Stellar natural beauty amidst a monument of man-made engineering. But the Gibson Dam, about an hour west of Great Falls, affords a truly singular panorama of the Sun River and its environs. The fishing and boating is very popular on the eponymous reservoir, and hiking opportunities abound. Whether you view the dam as an imposition on nature, or as part of a symbiotic marriage of the modern day, the view is indisputable: The sometimes rugged, sometimes rounded Montanan mountains, extending eroding fingers of conifer into opaque, icy-blue water, casting shadows on the monolithic stonework of human engineering. Resting upon the Flathead Indian Reservation, this Catholic-Jesuit church (ca1890) is home to dozens of original plaster paintings by Brother Carignano, the resident cook, who became a regionally-renowned religious artist and priest. From the entrance, the building opens up into high, cascading ceilings adorned with characters and symbols reflecting the frescoes of Renaissance Tuscany. Be you religious or otherwise, the character the church exudes, and the history attached to its property and surroundings, easily seduces one to thoughts of the Hereafter. Anyone who’s randomly perused ESPN at odd hours has likely watched lumberjacks taking comically-sized chainsaws to behemoth stumps, exhibiting skills seen by most as nostalgic relics of yesteryear. But Montana retains its historically-engrained attachment to the forest and its bounty—especially logging. Each July, at the peak of beautiful summer weather in the Bitterroots, Darby hosts the nationally-renowned Logger Days competition. Lumberjack superstars, timber enthusiasts and straight-ahead fun-seekers alike convene to show off, enjoy some music and eat local. But a day of festivities is best buffered by a good meal. Get a head-sized burger of quality Montana beef at Nap’s Grill, in nearby Hamilton.